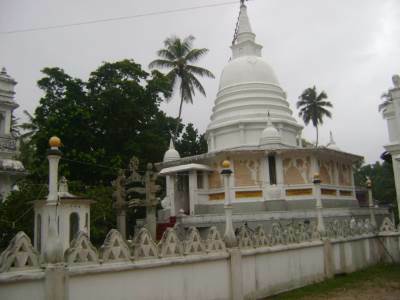 Return Kataragama to Aluthgama on Galle Matara road and from Aluthgama took the highway at Wellipenna. 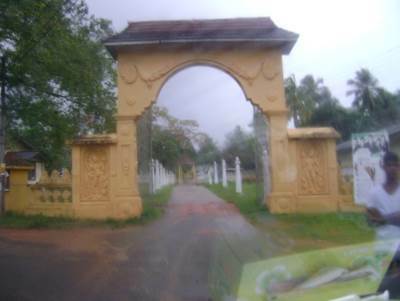 We made an unplanned trip to Kataragama on the 17th and 18th October 2015 and on the return trip decided to visit some important temples on the way travelling on Galle road. We onward trip to Kataragama was on the National Highway up to Matara. 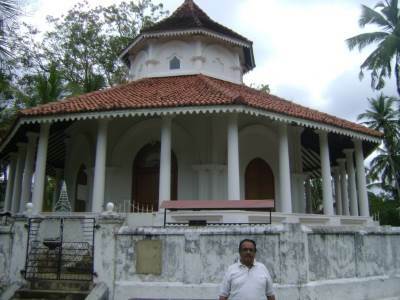 As we have visited few historical temples in Hambantota and Matara (see previous trip reports on Hambamtota and Matara) we decided to visit temples beyond Matara starting from Kataluwa. But the evening thunder showers was dampening and hampering the sight-seeing. 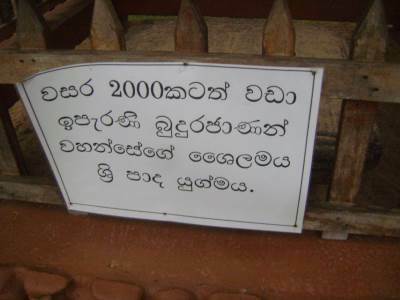 It’s also called Ranwelle Purana Viharaya. Actually there are two temples one adjoining the other. 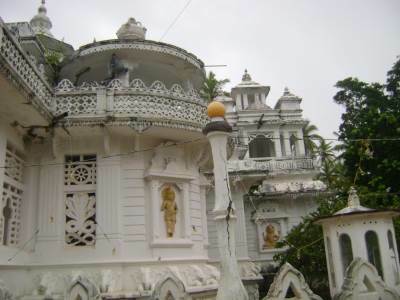 The temple is said to have been founded in the 19th Century by Reverend Bulathgama Sri Sumanathissa Dhammalankara Thera. 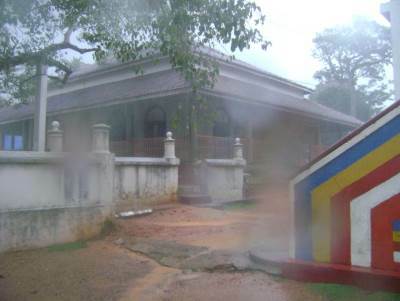 The temple later had to be divided due to a dispute between Asgiriya Chapter of the Siyam Nikaya and Amarapura Nikaya. 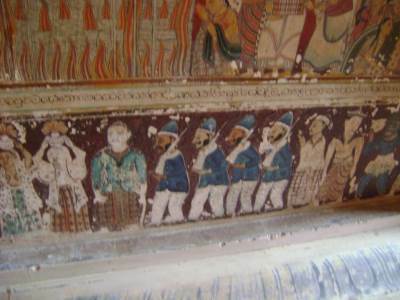 It happened because the Chief Incumbent of the temple chose to leave Asgiriya Chapter and join the Amarapura Nikaya. 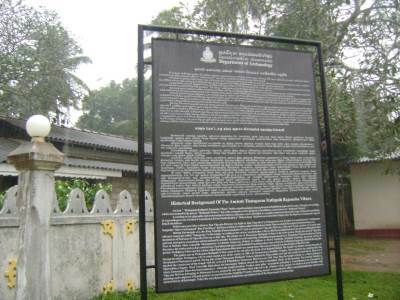 The plaque at the Dagaba say that it was constructed in 1841 by people of the village of Kataluwwa and one Amerasekara manthri and his wife. 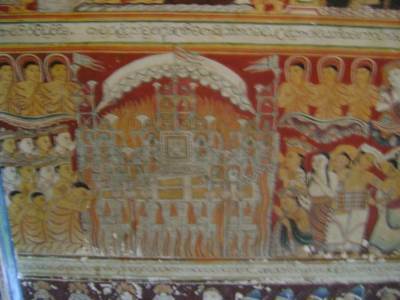 The middle chamber has paintings depicting events in the life of the Buddha while the outer chamber has paintings from Jatakastories and Suvisi Vivarana. 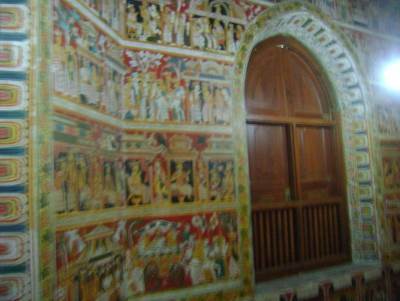 It is said that painting style belong to the southern maritime tradition, the paintings of this temple are conspicuous. Constructed by Rev. 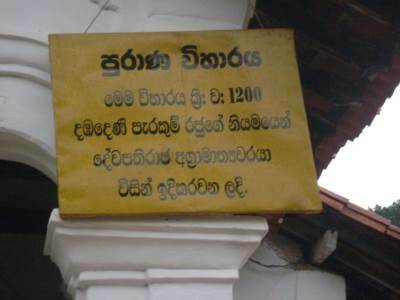 Kataluwe Gunaratna Thero, the doorway to the image house carries the date 1886. There are colonial style horse carriages, dresses, shoes, jewellery, lamps and there are even paintings of soldiers with guns as well as those drinking wine and playing cards. The usual guard carrying a sword had been replaced by a soldier carrying a gun. 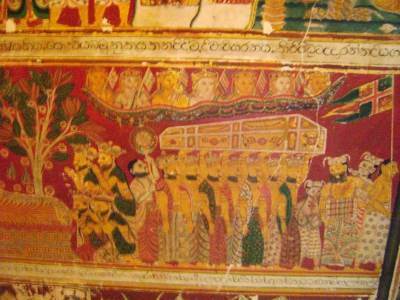 The traditional mode of transport for the elite was the palanquin or elephant. 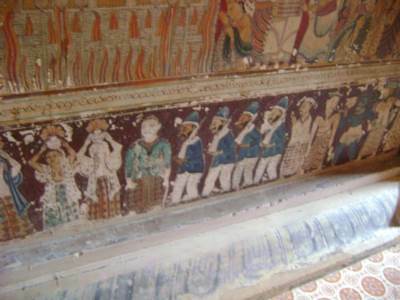 Although the traditional dress is commonly depicted in the paintings, in some sections, the traditional grab of both men women have been replaced with dresses, trousers and shoes. The other important item to see was the printing press. When Buddhism was in decline, a Buddhist revival movement emerged. 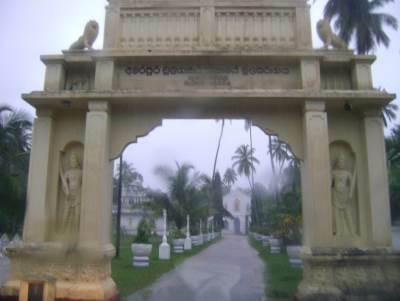 Bulathgama Thera also played a key role in this revival. 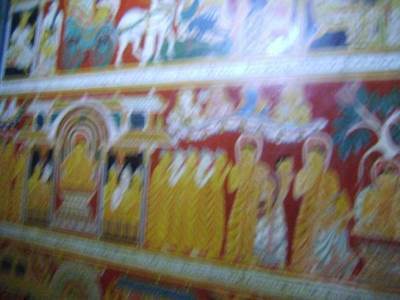 He understood the necessity for a Sinhalese publication to revive Buddhism in the country. 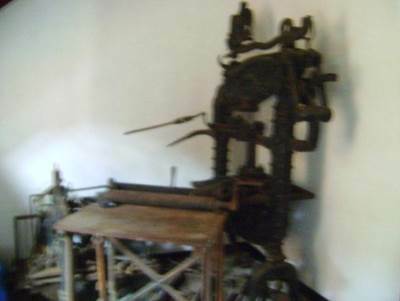 Through his efforts, Bulathgama Thera was able to raise money to buy a printing press. 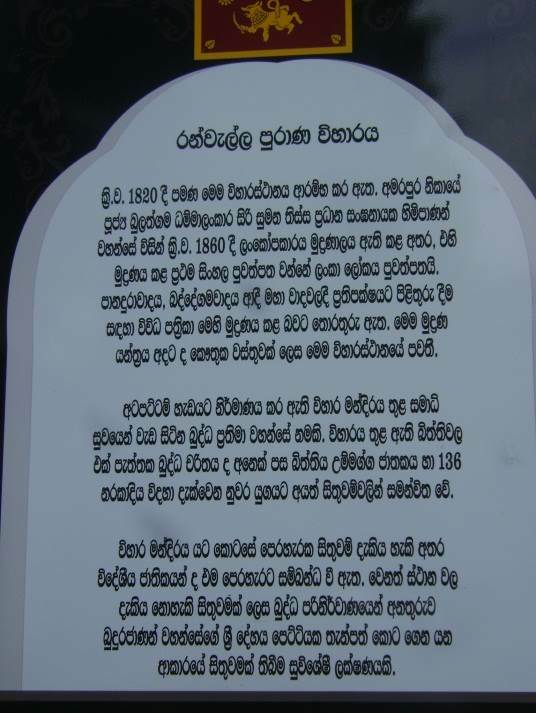 In 1860, the first Sinhalese newspaper in Ceylon, Lankalokaya, was published in Galle by the newly established Lankopakara Press. It is said that the first editor was a lawyer, William Perera Ranasingha. Mudliyar DWK Jayawardena was the publisher. The Lankalokaya was priced at six pence and was published on the 10th and the 24th of each month. 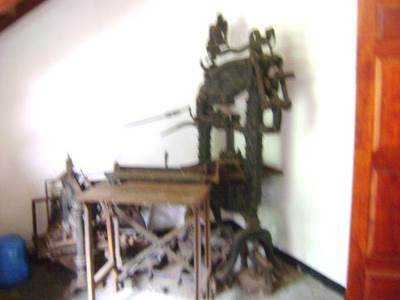 This historic printing press which played a significant role in the Buddhist revival in Ceylon later ended up at the Kathaluwa Purana Viharaya. It is unclear as to when the machine was brought to the temple. However, the Archeology Department and other institutions had been concerned about the safety and preservation of the machine. 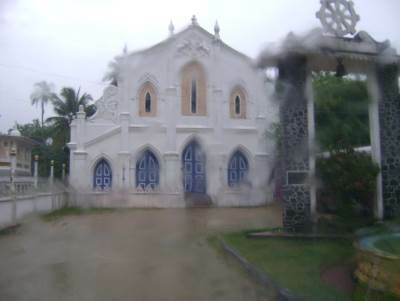 After leaving Kataluwa we arrived in Galle for lunch and rain hampered the onward journey. 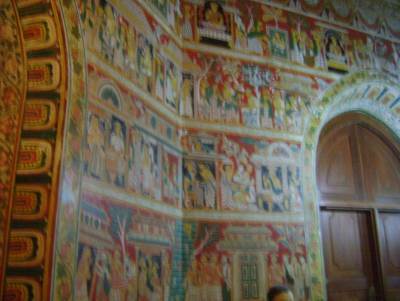 Any way we first visited the Thotagamu Ranpath Viharaya. 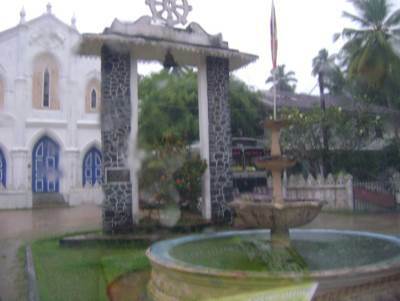 Totagamu Rajamaha Viharaya or the Ratpat Viharaya , or Telwatte Viharaya situated in the Galle district has been identified with the ancient Vijeyaba Pirivena at Totagamuva; one of the foremost institutions of learning in the 5th century Lanka. 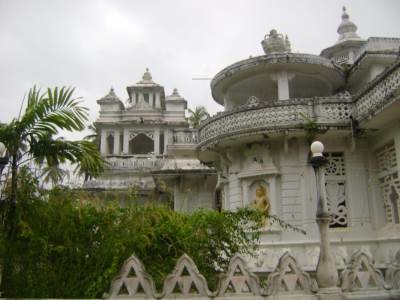 It was an institution traditionally regarded as one where sages with the highest spiritual attainments flourished. Of all these sages and scholars the most eminent was said to be the Ven. 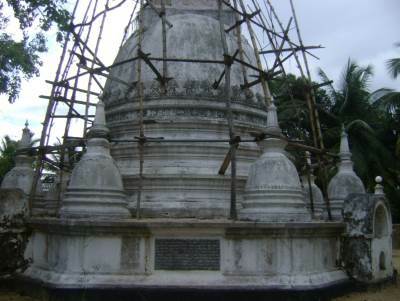 Totagamuwe Sri Rahula of Salalihini Sandesa fame. 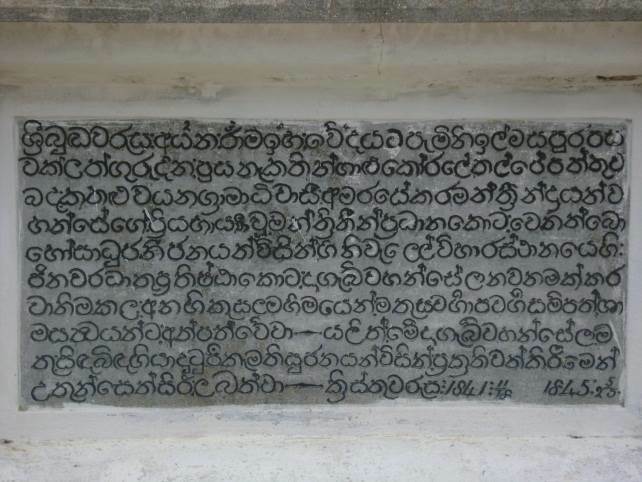 Reference to him in the Gira Sandesa indicates that he was an expert at the exegesis of the Abhidharma, Sutra and Vinaya pitakas, had an excellent grasp of the eight-fold grammar of the Sanskrit language, adept in the arts as well as of religion, well versed in the compositions of the most eminent poets, had an excellent grasp of poetics, composed Sanskrit poetry and his compositions were appreciated by other poets, was a master of the art of speech and a specialist in the 18 sciences which he expounded to other learned persons, gave spiritual counsel to the King Parakrama Bahu (VI) and that he was well versed in six languages. Unfortunately rain prevented us from getting down from the vehicle. From the road the building looks like a church. 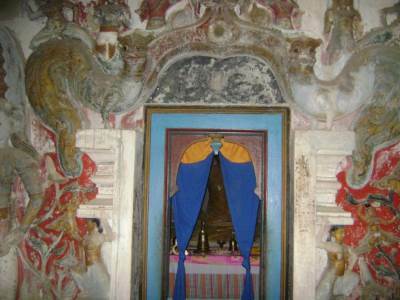 The high arched doors and windows decorated in very European style floral motifs make it look quite out of place in a temple compound because the temple is the Balapitiya Purana Vihare, the headquarters of the Amarapura Nikaya and the main temple in a staunchly Buddhist coastal area. 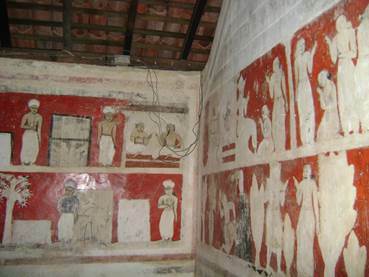 The ‘church’ is actually the bana shalawa or prayer hall of the temple. No one is quite sure of how the temple came to have this type of curious architecture. It is mentioned that there were two theories about this strange building, one is that it was built as a Christian church and abandoned and later donated to the temple. 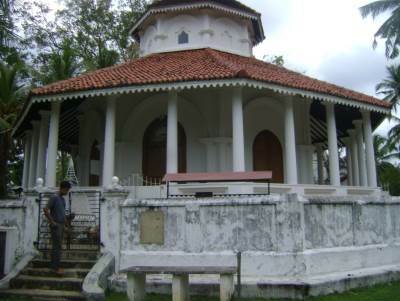 The other is that it was built as a Muslim mosque and abandoned. 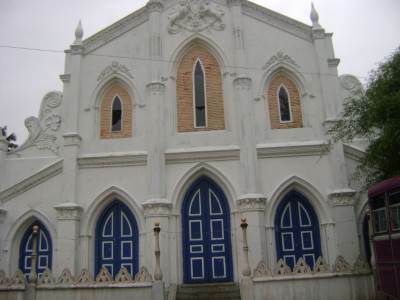 To add to its strange architecture, the facade of the building sports a large molded British insignia on top and a date reading 2414 in Buddhist years.It may have been originally built as a church by missionaries. 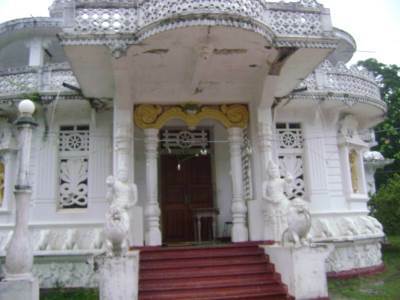 But Balapitiya is a town that despite its coastal location remained staunchly Buddhist. Even today there are so few Christians around this area manner.So it is quite likely that although the building was constructed, the church was never allowed to function here. And later the land and building would have been donated to the temple,” he said. As it was raining too the Buduge was not opened. As the rail was little improved we finally decided to visit the Ganegodella Rajamaha Viharaya at Kosgoda before returning home. 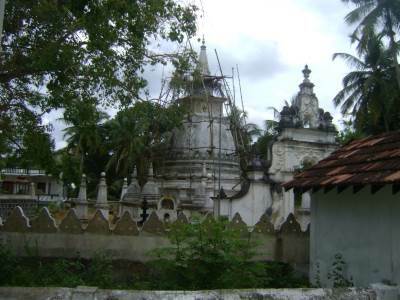 According to legend the Ganegodella Rajamaha Viharaya is believed to be built by Minister Devapathiraja on the orders of King Parakramabahu the second in the 12th century B.C. 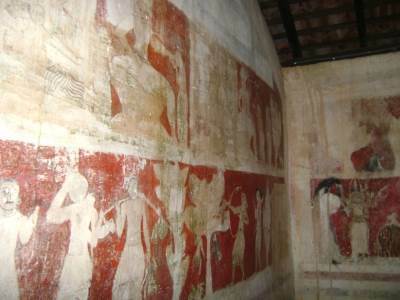 during Dambadeniya period. 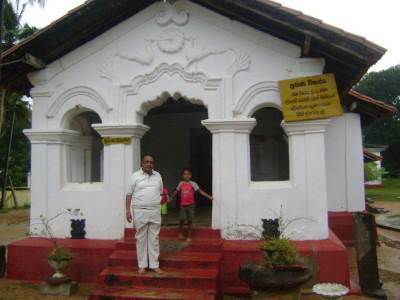 In addition to this temple there are number of temples and devalas built by this minister in the Ahungalla, Balapitiya and Kosgoda area. 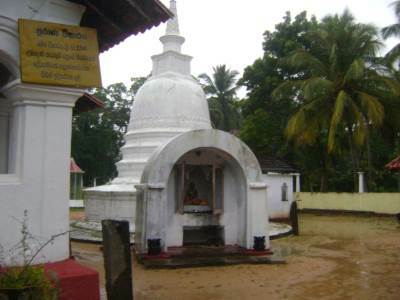 Legends states that the popular ‘Pujavaliya’ and ‘Sidath Sangarawa’ published under the sponsorship of minister Devapathiraja was written at this temple. 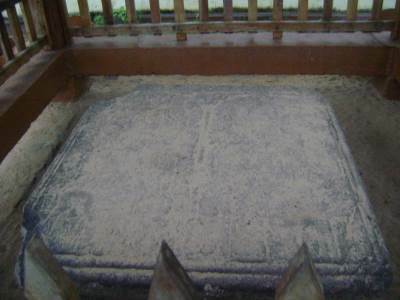 which a Buddha’s footprint is carved has been discovered recently and now placed in a special shed for veneration. This carving is said to be older than 2000 years. According to experts, this could be the oldest of this kind of carving ever found in the area. The stone slab had been lying there in the temple for centuries with no one noticing its value. 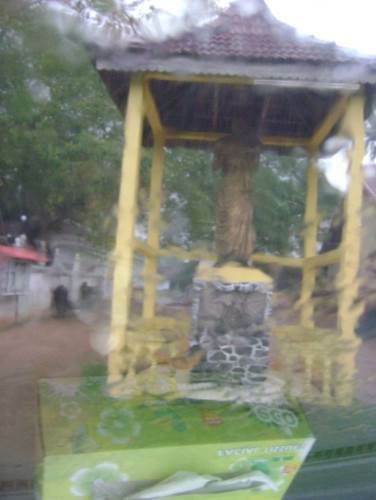 It is said that both feet of the Buddha have been carved on the surface of the stone slab and between them is a carving of chatra (an umbrella or parasol) indicating that it belonged to the early Anuradhapura Period. 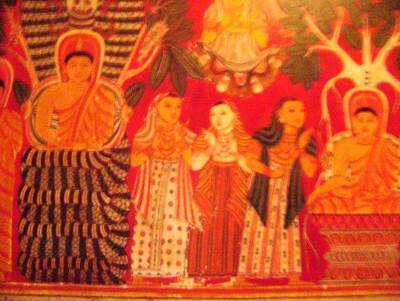 The Buddha’s footprints found after the Dambadeni Period did not have the chatra carving. Later carvings had only a single footprint each. 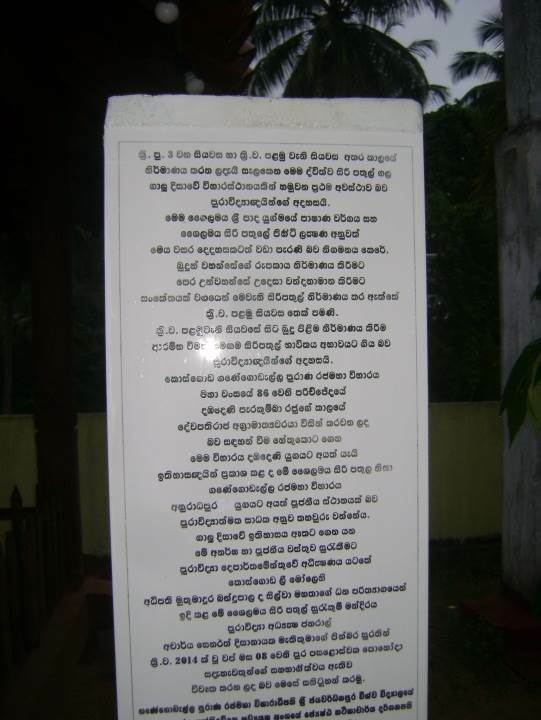 All these point to the antiquity of the Kosgoda Purana Rajamaha Vihara. Ganegodella Rajamaha Viharaya had spread over 250 acres before the foreign invasions but the invaders have reduced this land to about 6 acres.